Ireland has a well-deserved reputation for producing prolific playwrights although many of the most well-known, such as George Bernard Shaw, Oscar Wilde and even Spike Milligan have been quasi-Irish to say the least, living most of their lives in London (or perhaps France in the case of Beckett). So many full-blooded Irish plays in my own experience, despite being often popular with audiences, have been depressing, lamenting and insular in outlook (‘The Beauty Queen of Leeane’ being a prime example). It was then with a little trepidation that I went to see Gates of Gold, knowing it was essentially about a gay couple where one of them has a terminal illness and I have to say, was very pleasantly surprised. The well-presented split-set of a bedroom and a lounge sets the scene for a prolonged death-bed dialogue but this plays offers considerably more, with well-observed perspectives from the various other characters who each have their own issues. Also, instead of a predictable rant against the Catholic Church, there is ironically more discussion about Islam and the play is largely religion-neutral. Gabriel, the central character, is sensitively played by Stephen Moss and we really do get the impression of a genuinely sick man getting progressively weaker. It is largely the strength of Gabriel’s character which stops the play from descending into melodrama and there is something both touching and edifying about his realistic acceptance of his predicament. It is characters not facing death who have the real pent-up emotions and Victoria Johnson as the helper Alma, is seen to go on a real emotional journey, having faced recent personal bereavement. Contrastingly, Steven Cunio presents an interestingly under-stated interpretation of Gabriel’s nephew Ryan, trying to hold back his inner frustrations as we gradually learn more about him. Ryan’s mother Kassie, is quite the opposite wearing her heart on her sleeve, portrayed with gaiety and liveliness by Kathryn Fennell. Malcolm Cooper as Conrad, Gabriel’s partner, gives a sturdy performance as a man recognising his long-standing relationship is coming to an end, calmly accepting the situation with grace and support. The varied assortment of inter-character dynamics create an interesting scenario with Gates of Gold so much more than a man looking at the state of his life from his death bed. It is also refreshingly non-self pitying, in contrast to a number of Irish plays I’ve seen, being rooted in Irish perspectives without being dominated by them. It is first and foremost genuinely a play about people. 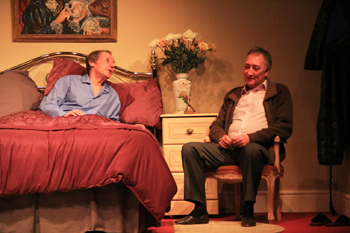 The play also takes a refreshingly relaxed attitude to gay relationships. The two men are old enough to remember when homosexuality was a criminal offence, but gay issues are not what the play is about, as the differences if the couple in question were to have been heterosexual and childless, would have been minimal. Tribute must also be paid to the set design for this play. Instead of typical box shaped set, often set at awkward angles, the bedroom has a convex curve which is very pleasing to the eye and the overall setting was very natural, avoiding anything to suggest this was a gay couple. There is something almost triumphant about the ending, performed with great feeling. A play well worth going to see, receiving full justice from the cast. Gates of Gold is on at Altrincham Little Theatre until Saturday 27th January.